EOO 36 km², AOO<36 km², small, subpopulations at 15-20 locations are declining due to poor recruitment and too frequent fire. It is likely that subpopulations were formerly much larger, as they are confined to pockets of deep sand among granite boulders, with all other surrounding low-lying deep sandy areas ploughed for pasture. Many subpopulations are moribund and consist of senescent adults, sometimes with a few young plants. 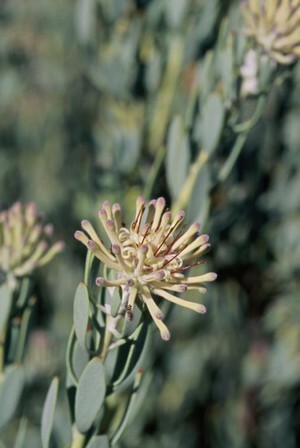 In the south on Rooiberg and Eselkop by contrast, subpopulations are burned too-frequently and appear to be declining. Largely confined to Kamiesberg Granite Fynbos, among large granite boulders or in the open along the foothills, 1300-1600 m.